Since it first began three years ago, Eaux Claires has staked its reputation on collaboration. It wasn’t just going to be a festival where Bon Iver performed for the first time in years—which, admittedly, was a large part of the draw at first—but a place where headliners, established artists and up-and-coming names mixed on stage and off. As each year ended, Eaux Claires listened to festivalgoers and tweaked things like the number of food trucks and the stage locations. But this year marked larger shifts. The announced lineup was smaller with fewer artists taking the main stages then in previous years; instead, there were additional smaller stage performances dedicated to collaboration and spontaneity. But by altering things so dramatically, Eaux Claires’ spirit transformed as well. Big Red Machine, the project from co-curators Justin Vernon and Aaron Dessner, took the colorful Creek stage. They repeated a handful of songs they had played to open the festival one day prior as People’s Mixtape Vol. 1, but the packed crowd raptly listened to their powerhouse jams. 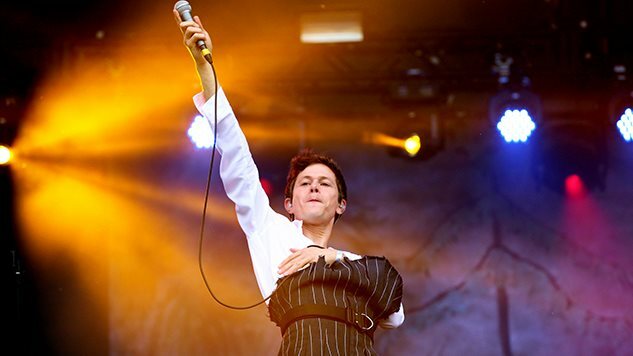 Perfume Genius (aka Mike Hadreas) commanded the largest of the two main stages for an oddly timed afternoon performance, which would have been better suited for a night slot. He played several songs off his new album No Shape, and closed with “Queen” off his 2014 LP Too Bright, filling the expansive stage space with his robust, yet delicate, energy. With severe storms threatening the area, organizers eventually changed Saturday’s lineup. Author and festival narrator Michael Perry took the stage in the afternoon to announce that nearly all small stage performances were cancelled (with the rest eventually getting the ax) and all main-stage performances were moved up to ensure headliners—Feist, Danny Brown, Paul Simon, and Wilco—got a chance to play. That shift transformed the collaborative spirit of the festival in order to balance between showcasing the artists it had promised attendees and ensuring timeliness and safety. Dark gray clouds looking closer to encroaching mountain peaks hung across the field, but the last four shows rolled on. “Your reputation has preceded you, Eaux Claires,” Feist told the excited audience when she took the stage for her only U.S. festival performance this year. She played her new album Pleasure in its entirety, narrating the turns it took from side A to side B. Where Sylvan Esso and Chance the Rapper gave Friday evening a spirited, youthful energy, Danny Brown injected the overcast day with the same vigor. He performed “Smokin and Drinkin,” “Break It [Go]” and “25 Bucks,” among others, and never lost the smile on his face. After a sudden and gusty downpour delayed his set by over 30 minutes, Paul Simon took the stage, bowed and began performing with orchestral group yMusic. Highlights included “America,” “Kathy’s Song” and “The Boxer,” before closing with “The Sound of Silence.” It was a memorable affair, an “experiment,” as Simon put it. yMusic has performed at Eaux Claires since its inauguration, and their time with Simon showcased what the festival does so well: bring artists together to fuse new sounds. Wilco closed out the last day, bravely soldiering on in the face of what can only be described as apocalyptic-looking weather. Though the rain held off, thunder and lightning put on quite the show in the distance as the clouds darkened beyond black. Eaux Claires is still finding its footing, willingly playing with its identity in order to figure out what works. Do artists have the freedom to experiment on stage when certain attendees may expect to hear something more familiar? Does endless spontaneity eventually become overly structured and stale? How do the musicians keep the spirit alive while infusing each year with enough new adventure to keep people returning? These are all questions that organizers still face, and it’s clear they’re trying to work things out. As an answer to monoliths like Coachella, Eaux Claires is about going with the flow, and that’s no light metaphor considering that it takes place along the Chippewa River. Each year will be distinct from the last—in both exciting and enervating ways. After all, you cannot step into the same river twice.